Air Blast and Adiabatic Coolers for sealed water cooling systems and reducing maintenance costs on both the cooler and the equipment it serves with the added benefit of reducing health and safety issues created by the operation of evaporative cooling towers. Units are available from 5 Kw upwards. ● Chemical water treatment not required. ● Cleaning and chlorination not required. ● Sealed system, no contamination of the water algie does not grow. ● Water losses through evaporation is eliminated. ● Low operating noise levels. 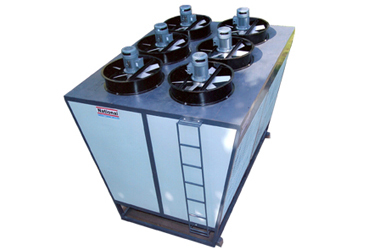 ● Unsightly plumes of water vapor coming from your cooling equipment is stopped. ● Fully packaged units incorporating pump, tank and starting equipment.